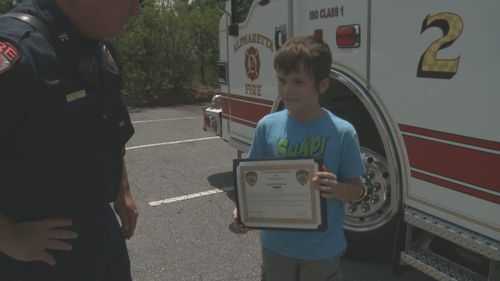 ALPHARETTA, Ga. -- An Alpharetta boy was honored for his bravery and got to ride around town in style. Firefighters picked up 11-year-Old Hayden Hardy and his family in a fire engine and took them out for ice-cream. Hayden earned the special reward after saving his mother's life. He called 911 after his mother collapse during a serious medical emergency. "I said, 'My mom's not breathing right,'" he said. "They said they were going to send some paramedics like that and then I said, 'Please send some paramedics.'" Hayden says some helpful police officers taught his Boy Scout troop how to react in emergency situations.